Streets decorated like it’s the Middle Ages, majestic parades, and exciting battles! Yep! You guessed it! We’re talking about the Festivals of the Moors and Christians, celebrated every year in Spain during multiple days full of legends and spectacular events. In these celebrations we remember, as faithfully as possible, the cruel historical battles that took place between the Moors and the Christians during the Reconquista of the Iberian Peninsula. These popular festivals draw attention to themselves, not only with all the people that attend (thousands of people), but with the history, culture, and the revelry that comes with it. The costumes, which are perfectly designed, manages to bring to life even more one of the most important periods of Spanish history. This festival has been celebrated since the end of the 17th century, mainly in the east of Spain, with its main centers in the province of Alicante and the southern part of the province of Valencia. However, there are many other Spanish places that celebrate this event. These festivals attract a wide variety of patrons, who could be locals, people from around the area, people who traveled from a far away part of Spain, or even people who traveled internationally. It is very difficult to list every single town that celebrates the Festival of the Moors and the Christians in Spain, so we will keep our list short and sweet and tell you about only the most impressive. 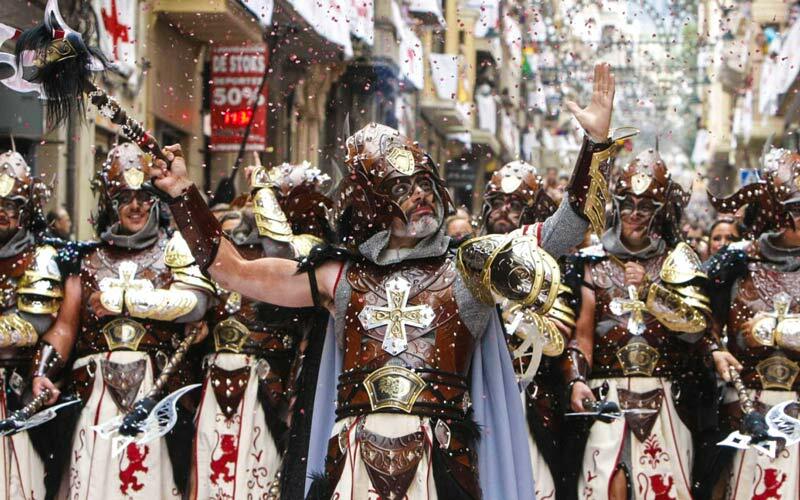 The Festival of the Moors and Christians in Alcoy (Alicante) is the most popular for its history as the festival’s birthplace and for its spectacular events, which has turned it into a festival of national interest. It reenacts the battle that took place in 1276 between the faithful of the Arabic warlord Al Azraq, who intended to attack the village, and its inhabitants, who fought to defend it. 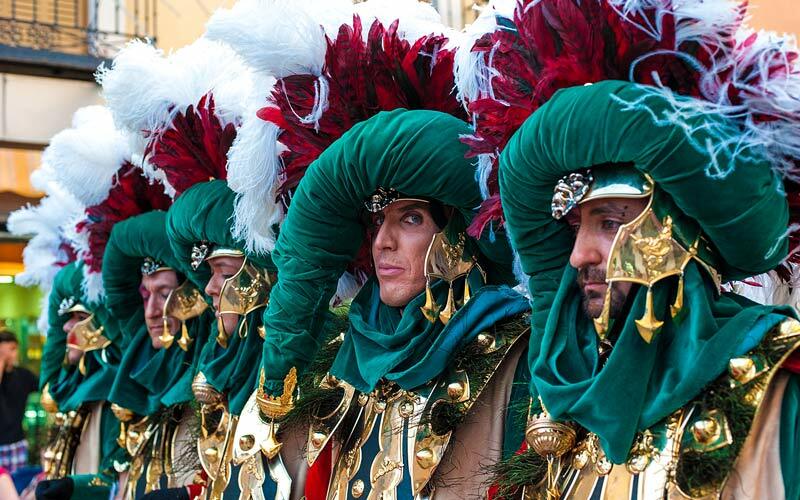 It has been celebrated since the 16th century, and it pays homage to its patron saint, San Jorge, who, according to the legend, appeared in full battle dress and helped the Christians in defeating the Moors. During several days in the beginning of May, the different homages and parades for both armies take place. Normally, an estimated 5,000 people participate in these events. On the third day, they reenact the battle of the Muslim assault on the castle, which they follow with the recovery of the fortress by the Christians. The high point of the show includes San Jorge firing arrows from the top of a tower in the night. Another of the key places for the festival, which has also garnered international interest, is Villajoyosa (Alicante). In this celebration, people remember the attack of the Berber pirates and their opposition by the village’s inhabitants. 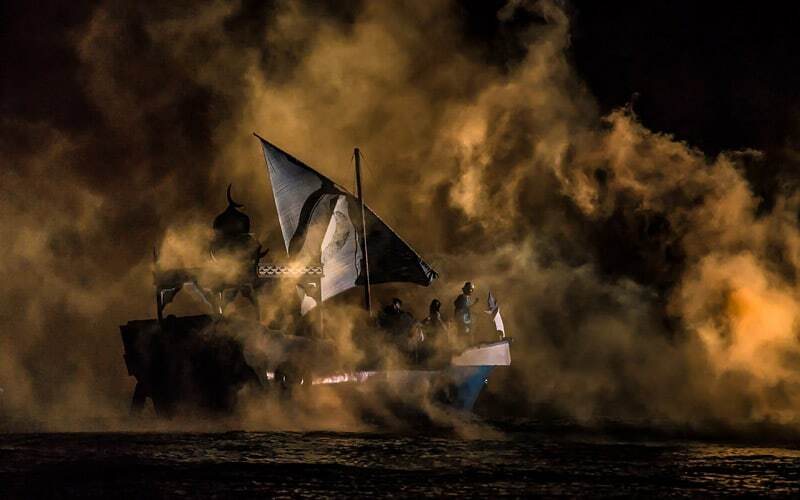 The most popular event of this festival is the reenactment of the naval battle and the resulting disembarking onto the beach. It consists of a magnificent spectacle charged with artificial fires, drums, and lights, leaving its onlookers astonished. If you are interested in attending this event, it takes place every year during the second half of July. Caravaca de la Cruz (Murcia) is the only non–Valencian place that has gained renown internationally. Just as in the other towns, this town celebrates this festival with processions and parades for both armies. 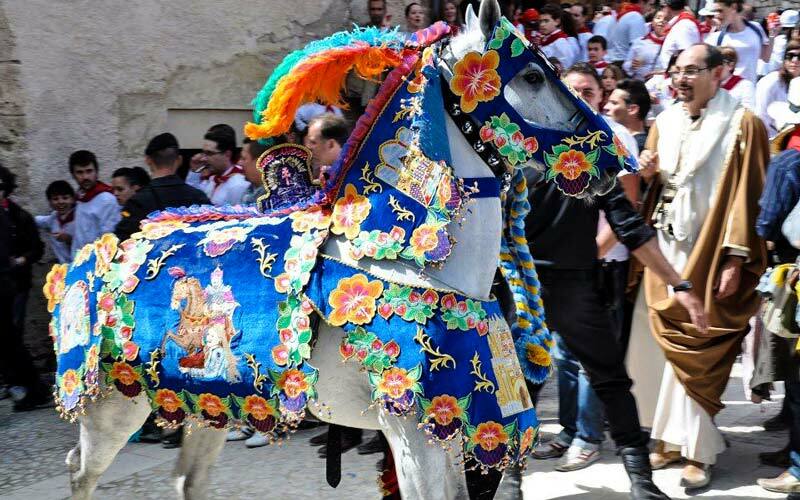 The most popular event is the celebration of the Caballos del Vino (wine horses), in which the horses race while wearing handmade silk and gold mantles. This celebration usually takes place during the first week of May. Representing Castilla–La Mancha stands out the Moorish and Christian festival of Alcázar de San Juan. The stars of this historic commemoration are the music, the colors, and the gunpowder. A point of interest is the Vela de Armas, an exact recreation of the appointing of the candidates to the Orden de los Caballeros del Hospital de San Juan de Jerusalén. Of all the celebratory events, the Entrada Mora y Cristiana, the Escalada al Torreón de Don Juan de Austria, the Auto de Nombramiento de un Caballero Cristiano, the Lucha entre Ambos Bandos, and the Gran Mascletá of artificial fires are the ones that attract the most viewers. We also suggest that you go to the picturesque Mercado Medieval to experience the everyday life of the Alcazareños of that era. Music, jugglers, jesters, and dancers fill the streets with joy and entertain the visitors. This festival takes place at the end of the week closest to June 24th, the Día de San Juan. Many other places in Spain, such as Calpe (Alicante), Altea (Alicante), Cáceres, Biar (Alicante), Benamahona (Cádiz), Campillo de Arenas (Jaén), and Elche (Alicante), also host these Festivals of the Moors and Christians. Have you ever been to any?